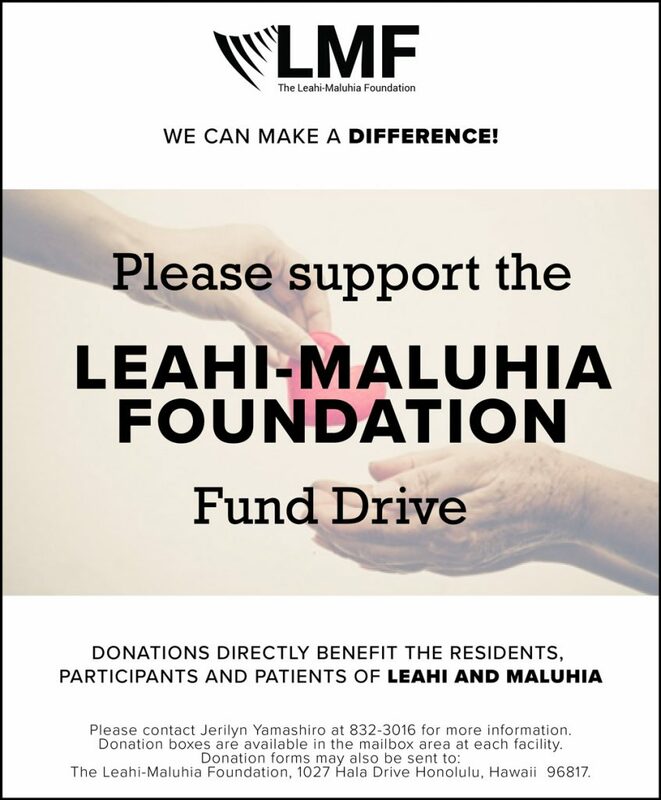 The Leahi-Maluhia Foundation is a nonprofit 501(c)(3) organization established in 2003 to support the work of Leahi Hospital and Maluhia Long- Term Care Health Center in their mission, development, and provision of quality health and long-term care, primarily targeting seniors. As the Oahu Region of the Hawaii Health Systems Corporation, Leahi and Maluhia are part of the State’s safety net healthcare system caring for approximately 500 people a day, through inpatient and outpatient services. Hawaii will see a large growth in its senior population over the next twenty years. We have the longest life expectancy of all 50 states. By 2020, one in four of Hawaii’s residents will be over 60 years of age. Those 85 and over will triple in numbers by 2030. Combined with rising healthcare costs, the impact will be felt by both facilities and programs delivering care and services and those seeking them. The challenges are, indeed, great. Leahi and Maluhia strive to be centers of long term care excellence. The Foundation can help in this mission by raising funds for programs, equipment, and special projects. Our commitment is to support the values of Leahi and Maluhia in their dedication to providing the excellence in long-term care. We want to continue to be part of the community’s support of the needs of our elders. With the generous help of supportive community members, The Leahi-Maluhia Foundation seeks to make a difference in the healthcare of Hawaii’s seniors both now and in the future. If you are interested in becoming a Board member for the Leahi Thrift Shop, please submit an application form to Michelle at mkato@hhsc.org.